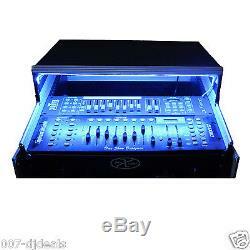 PRO X 2U FRONT 10U TOP LOAD MIXER COMBO RACK w/ SLIDING LAPTOP SHELF & LED KIT This listing does not come with any equipment shown in the pictures. You will receive a mixer combo Rack and a LED KIT to install in the case. Brand New In Factory Sealed Box ProX T-2MRLT Pro DJ Combo Case- Built to the most demanding specifications. Pro X Case T-2MRLT, 2U vertical rack, 10U slant mixer rack system has all the best features you're looking for in a world-class flight case: strength, durability and reliability with flexible options and sizing for different applications. This heavy-duty professional combo rack is 19 deep and features 2U front loading and 10U top loading rails for convenient security for a wide variety of pro DJ mixers. Other design highlights include a large swinging rear door (for easy wiring) with a beveled cable hole for permanent or semi-permanent installation. It also includes two handles on either side of the case for convenient transportation. 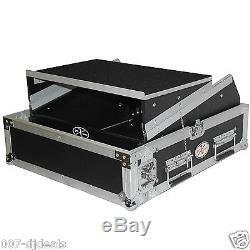 This case also includes a sliding laptop shelf for digital DJs who need to have all their gear accessible at once. PROFESSIONAL COMBO RACK 19 DEEP. TOP AND FRONT REMOVABLE LIDS. LARGE REAR SWINGING DOOR FOR EASY WIRING ACCESS. Durable and solid rack rails. 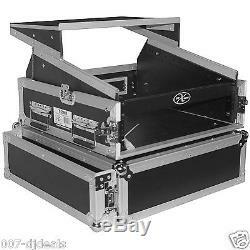 ATA 300 Flight Ready Road Case. 2 Spring action Handles per Side. Easy locking fit and tongue. Heavy and powerful ball corners. Industrial strength latches and rubber feet. 21.5L x 24D x 13H. 26 x 23 x 15. 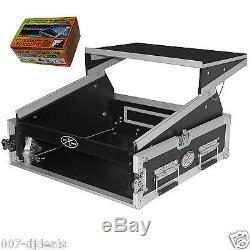 Are you looking to add that extra flair to your DJ/mixer case. With the XS-12LEDKIT which is a 12 color chaging LED tape which can be installed underneath the sliding laptop shelf gives your setup that added flavor needed to make your case look awesome. 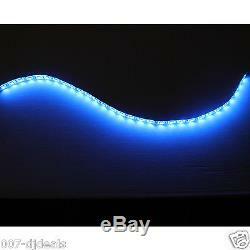 This led kit comes with a controller which enables you to change the color and go into different modes. You will be able to color coordinate your case with any setup at any venue on the fly. We have the largest selection of Speakers, Amps, CD/MP3 Players, Mixers, Turntables, Lighting, Karaoke, Cables, Recording gear, Flight Cases and more. From ALL the top brands, including Mackie, Crown, JBL, American DJ, Pioneer, Denon, TOV Cases, TOV Lighting and many, many more. We make paying for your item as simple as possible. Orders Sat - Sunday - Ships Monday Orders Monday - Ships Monday or Tuesday. And receive return instructions if you receive a defective item. YOU ARE PURCHASING BRAND NEW SEALED IN BOX ITEM. They are lower quality and often stop working after a short period of time. 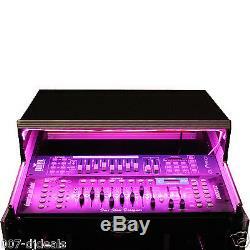 007Deals, WHOLESALE DJ EQUIPMENT TO THE PUBLIC!! We have full lines of DJ equipment in stock. Has been established for over 12 years now and is your number one source for Pro DJ Equipment, Pro Audio, Stage Lighting and Nightclub Lighting at discount and wholesale pricing. We offer the best service and we guarantee our prices are lower than our competitors. From ALL the top Brands. Including Mackie, Crown, JBL, American DJ, Pioneer, Denon, TOV Cases, TOV Lighting and many, many more. Please let us know how we can make yours a five-star rated one too! If you are not satisfied, please let us know before leaving feedback. 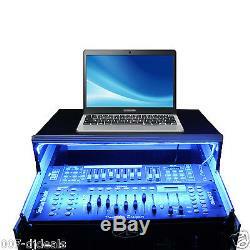 The item "PRO X 2U FRONT 10U TOP LOAD MIXER COMBO RACK with SLIDING LAPTOP SHELF & LED KIT" is in sale since Monday, July 8, 2013. This item is in the category "Musical Instruments & Gear\Pro Audio Equipment\Cases, Racks & Bags". The seller is "007-djdeals" and is located in Brooklyn, New York.